The Evergreen Rodeo Association is here to keep the tradition of our home-town, grass-roots rodeo alive, to preserve American heritage and the history of our mountain community, and to promote the safety and well-being of today's cowboys, cowgirls and animal athletes. 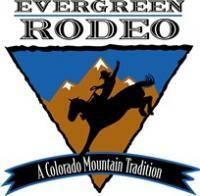 The Evergreen Rodeo, shares a tradition of Evergreen that dates back to the 1920’s of friendly , neighborly competitions, among the cowboys and ranch hands from the many ranches that stretched throughout our area of the Rocky Mountain foothills. We welcome you to share the passion of Rodeo, the love and beauty of well bred livestock, the thrill of competition, and to witness the heart of being a PRCA Pro Rodeo Cowboy or Cowgirl. A weekend to remember! Father's Day Weekend each year. We are proud to meet the high standards of, and be sanctioned by the PRCA, Professional Rodeo Cowboys Association.